When we hide from life, we miss living it. Life's full of wonder, let's enjoy it. Take another deep breath move to the next point and repeat this through all the points on the picture. After the last point take three deep breaths and check your number repeat this until your number is where you want it. Way to go on tapping! One dark rainy night my young daughter and I were going home when my car wouldn’t shift. We were dead on the road on a blind curve of a busy street. All of a sudden a car appeared and stopped behind us. He started approaching my car door, frankly I wasn’t sure if we were in more trouble or assistance had arrived. Then he asked if he could help and somehow he got the car in gear. He made sure we were off busy streets before going on his way. That night I believe I met an Angel on earth and my daughter and I made it home safe. Thank you to all the kind people and angels out there aiding others. Let’s be open to the possibility of angels and kind people. Let’s step outside our comfort zone today and do something fabulous! Take another deep breath move to the next point and repeat this through all the points on the picture below. After the last point take three deep breaths and check your number repeat this until your number is where you want it. Take another deep breath move to the next point and repeat this through all the points on the picture above. After the last point take a few deep breaths and check your number repeat this until your number is where you want it. When we’ve been hurt before it can be scary to risk feeling it again and we can resist or avoid it. Let’s tap into our courage and step out into life again, it’s worth it! Let's Have a Great Day! Have you ever felt stressed about finances? Recently I woke up feeling that way. The stress felt strong and I decided to do some tapping on it. My stress dialed down and I went about my day. During the afternoon I was checking in on my stress and was amazed at how much peace I felt compared to when I woke up. The next day I woke up in a better space. I am glad I have tapping to help dial down my stress and bothersome emotions. It makes room for more peace and joy in my life. What de-stressors do you use that work for you? Take another deep breath move to the next point and repeat this through all the points on the picture below. After the last point take a few deep breaths and check your number repeat this until your number is where you want it. When we have new life events it can be a beautiful gift full of wonder and joy. With this often comes change and this can sometimes feel stressful. ​Let’s release the stress and be open to new amazing life events. 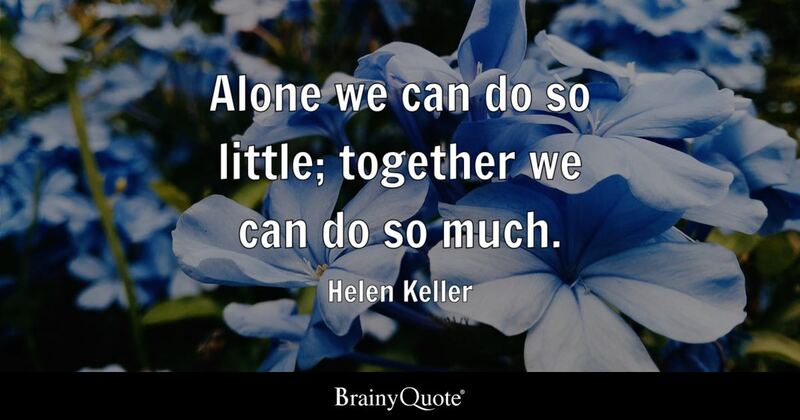 ​Helen Keller quote: "Alone we can do so little; together we can do so much"